Join us at YogaOnCrete and experience the lightness of body and spirit and joy of honouring and nurturing the needs of your body, mind and spirit through the practice of yoga and creative dance, daily encounters with the cool, turquoise Mediterranean waters at quiet beaches, idyllic unspoilt surroundings, and wholesome local food, excursions, a warm and welcoming group of people and much more! During this course, the common threads of awareness and presence that run through Hatha Yoga and the interactive experimentation with movement, rhythm and voice, in Dion’s fun-filled approach to Creative Dance, will be explored. The slow and consistent progression of breathing techniques and postures, in the flow-based Hatha Yoga classes, allows one to open up, while mindful, spontaneous movement is also often used as a tool towards inner balance. Guests can further connect with the body’s innate need to move and dance in joy in the creative dance classes, which incorporate elements of Capoeira Angola, Afro-Brazilian dance, Tai Chi, Dance therapy, and Contact Improvisation. Each yoga and dance class build upon the next, in a slow and consistent progression that allows opening up and experiencing. No previous experience in yoga or dance is required for participation in the course. The week begins with an introductory yoga and dance session at 6.00 p.m. on the day of arrival, followed by dinner. All other days will begin at 8.00 a.m. with the Anagenis Yoga class. After breakfast guests are free to relax and enjoy the beach and sunshine, receive a massage treatment, or explore the village and region. In the late afternoon there is the Creative Dance class, and the day's programme closes with dinner. The fourth day of the week is a rest day from classes; guests can join in an optional excursion, including a guided hike through the magnificent Aradaina gorge (approx. €25 depending on number of participants). All breakasts and 5 dinners are offered at the house, while two of the nights guests are free to dine out in the village restaurants (not included in the course cost; approx. €15 for a full meal including drinks). Individual excursions (e.g., hikes, boat trips) can also be arranged at an extra cost. On the last day, departure can be arranged after breakfast. Anagenis – re-birth (from the greek word anagennisi) in every level of your being, through conscious presence in every action and glow with light and joy emitting a positive uplifting vibration. Anagenis Yoga – is an invitation for awakening, it is an invitation for releasing the inner tension and a transition to esoteric harmony, peace and surrender to the Divine Intelligence/Wisdom within us. Taking that inner dive we open up to experience a conscious journey of Transformation and a ReBirth. Anagenis Yoga classes are for those who want to delve deeply inward and discover the connection between Mind-Body-Soul and how beliefs affect health, longevity and wellbeing. At the same time it is a path of empowering, strengthening, increasing flexibility and revitalizing the entire being. Knowing your self and the world from within. I am honored and thrilled to share these practices with you and have the opportunity to be a part of your experience of discovering your true Inner Beauty and Wisdom. Happiness In All Ways to You! In this set of classes, the aim is to explore a relaxed and present state of body and mind, our relationship to ourselves and others and the connection to our environment, guided through rhythms. The movements are loosely based on Capoeira Angola and the rhythms are influenced by Afro-brazilian culture. We will be exploring connections to our own flow of movement through ease and grace, to others and to the environment, as we dance on the playground of liberation, letting go of the mind and tuning in. This joy-filled journey takes us through various landscapes of our emotional body and releases our uniqueness and our true self. Working from grounding and sensing techniques through to a lightness-of-body state, as we explore a multitude of ways our body can flow, turn and invert, we will see the world from different perspectives and positions and dance the dance of life! Dion began teaching capoeira in 1998, and has been constantly developing ever since, guided by his passion to investigate and nurture the body. Four trips to Brazil followed, resulting in his title of Contra-Mestre by Mestre Marrom of Rio in 2011. Meanwhile, he also practiced Chi Gong and Yoga, further fueling his desire to share health and joy through breathing and postures. 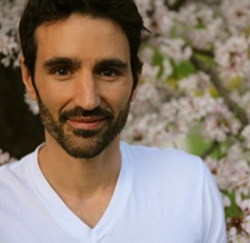 In 2015 Dion graduated from a 200 hour Yoga teacher training and became a part owner of Akasha Yoga studio in Roslindale, Boston, where he teaches regularly with a focus on explorative and restorative Yoga. He comes open heartedly to offer his passion and insights gained through his personal practice. €500 shared accommodation in twin non-ensuite room (with use of communal bathroom). €590 shared en suite accommodation (3 in a room) or single non-ensuite (with use of common bathroom). €640 shared en suite twin or double room. €800 single en suite accommodation (please note that single room availability is limited). €490 work-exchange option (only one place per week): about 2-3 hours’ help per day with light household tasks (e.g., washing dishes, cleaning yoga studio) that does not interfere with the attendance of all classes. Accommodation in triple ensuite or twin non-ensuite room.